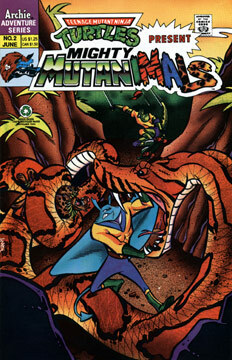 The Mutanimals begin the Path of the Four Winds to find Juntarra. They use an old bone and snake rattle called an Exodus to steer them in the right direction. Their travels eventually lead them along the Serpent’s Path, where they are attacked by a giant snake. The beast grabs Wingnut and breaks his mechanical wings. The others grab the snake’s body and tie a large knot into it and then manage to escape the monster by slipping through a cave it cannot fit through (due to the knot). The Mutanimals advance through the caves until they come upon a humanoid snake named Snake Eyes. The snake man asks what they seek and Jagwar explains their mission. Snake Eyes recalls Juntarra and tells them that she passed his test with ease and challenges them to do the same. The beastman removes his sunglasses and all of our heroes are immediately mesmerized by his gaze. Snake Eyes then states that each of them will be forced to deal with their past – and he picks Wingnut to be the first, as he senses a great weight upon the alien’s shoulders. Wingnut remembers his past, and how his crippled wings prevented him to fly like everyone else – everyone else, save for Screwloose, who also had a set of inoperative wings. The two became instant friends and pooled their allowances until they could buy Wingnut a set of artificial wings. Later, Wingnut recalls how his world was invaded, and how he witnessed the death of his parents as they were gunned down by alien spacecraft – driving the young batman insane. Snake Eyes breaks off the trance and Screwloose reprimands the snake dude from forcing his friend to relive his trauma, especially after he’s already had his artificial wings broken. Snake Eyes tells Screwloose that one must shed the past if one wants to be free, and then tells the bug that he’s next. However, Screwloose has no interest in reliving his past, so he bites Snake Eyes and gets him to look into his own gaze via a reflecting pool. Snake Eyes becomes mesmerized by his own powers and the Mutanimals take their leave. Later, the guys have built a campfire. Wingnut reveals that he actually feels better, more relaxed and relieved. Jagwar explains that he has successfully completed the Serpent’s Way and has shed the weight of his past. Wingnut laughs in glee and Screwloose smacks himself in the forward, because he prevented the rest of them from doing the same. The flightless mosquito apologizes to his friends, but Dreadmon tells him not to worry about it, as he was only doing what he thought was best. Meanwhile, the skeletal figure has taken Juntarra to his skull fortress in the desert.